With back to school comes back to packing lunches. Beyond the sandwiches and juice boxes comes another consideration for moms and dads — the snacks. Naturally, kids will gravitate toward the snacks given the choice, so it’s up to the parents to pack snacks that are not only nutritious, but also ones that kids actually will want to eat. Up for the challenge? On the following pages, you’ll find five simple lunchtime snacks any child would want to find in a lunchbox, bag or tote. You can also get your children involved in the process by having them help you prepare the snacks. Banish bland lunchtime snack woes and send your children off to school with these cool snack creations. These muffins offer a variation on the lunchbox sandwich staple. Preheat oven to 400 degrees F. Line a muffin tin with paper baking liners and set aside. In a large mixing bowl, combine flour and baking powder; set aside. Place milk, peanut butter, sugar, eggs and salt in the bowl of a food processor. Blend until the mixture is smooth. Pour liquid mixture over dry ingredients; stir just until the dry ingredients are moistened. Fill the baking liners one-third full of batter. 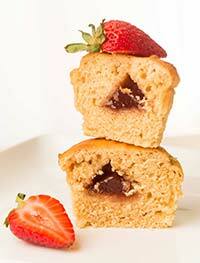 Place about 1 teaspoon of jam in the center of each muffin. Top with remaining batter until baking liners are about two-thirds full of batter. Transfer muffin tin to oven and bake for 15 to 18 minutes, or until tops are lightly golden brown. Remove muffin tin from oven and allow muffins to cool for 5 minutes. Store in an airtight container up to 1 week. Makes 12 muffins. Customize your snack creations with this variation of a popular children’s snack. This homemade flavor combination beats any prepackaged salty snacks hands down. 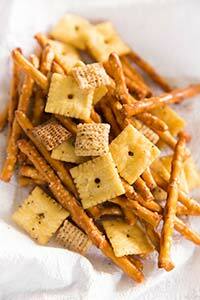 In a gallon resealable plastic bag, combine wheat and rice squares cereal, crackers, pretzel sticks and oil. Seal bag and gently shake to coat dry ingredients with the oil. Add cheese, basil, oregano and rosemary to cereal mixture; reseal bag and shake to evenly coat mixture with seasonings. Store snack mix in an airtight container for up to three weeks. Makes about 32 half-cup servings. These sandwiches are easy to assemble in advance. Either freeze or refrigerate the sandwiches until your children are ready to take them to school. 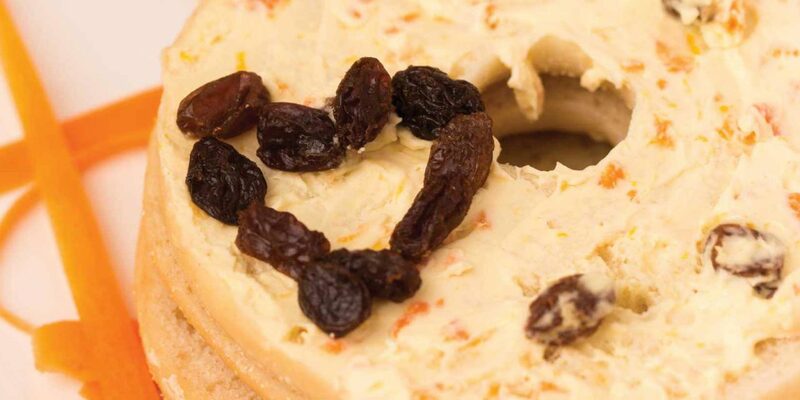 In a small mixing bowl, blend cream cheese, orange juice, orange zest, carrots and raisins. 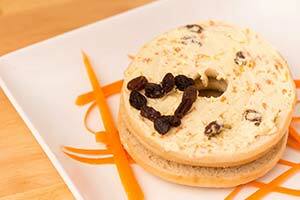 Spread one bagel thin with an even layer of the cream cheese mixture. Top with a plain bagel thin. Serve immediately or wrap in plastic wrap and transfer to the refrigerator or freezer until ready to serve. Makes 6 sandwiches. This not-too-sweet dip makes eating fresh fruits more appealing. 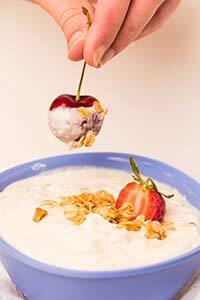 In a small mixing bowl, combine yogurt, applesauce, granola, cinnamon, nutmeg and ginger. When ready to serve, transfer smaller quantities to resealable plastic containers. Serve with desired fresh fruit. Makes about 1 1/2 cups. 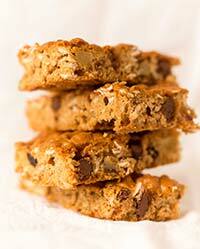 Fuel your child’s lunch with these flavorful and fruity oatmeal bars. Butter the bottom and sides of an 11-by-15-inch jelly roll pan. Line pan with a piece of parchment paper and butter paper. In a large mixing bowl, blend sugar, vegetable oil, honey, water and eggs. Add flour, oats, salt, baking soda and cinnamon and stir mixture until combined. Fold in raisins, pineapple tidbits or other dried fruit, walnuts (if using), coconut and chocolate chips. Spread mixture evenly over the parchment paper in the prepared baking pan. Bake for 15 to 17 minutes, or until the top of the bars are lightly golden brown. Transfer bars, still on parchment paper, to a wire rack to cool. Cut into 24 bars.